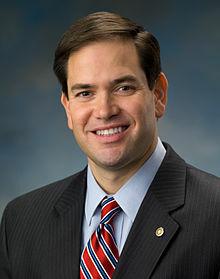 Florida Sen. Marco Rubio has already started the process for running for president in 2016 with an appearance in Iowa. He has begun in classic form. In 2008, many people were shocked when most of the GOP candidates said that they did not believe in evolution. Rubio has now added his voice as denying scientific reality to court evangelical votes. Rubio insisted in an interview with GQ that the age of the Earth remains “one of the great mysteries.” Of course, the age of the Earth is about as much of a “mystery” as whether the Sun revolves around the Earth or the Earth revolves around the Sun. The age is roughly 4.5 billions years — an inconvenient fact to be sure, but a fact. Rubio wants to court people who believe that the Earth is between 6,000 and 10,000 years ago despite fossils and radiometric dating going back millions of years. The question is whether we should even consider someone for the presidency who denies such a clear and established fact. At what point is the denial of reality a threat to the nation in a commander and chief. Of course, some of these candidates may secretly accept reality, but that may be ever worse if you are willing to deny established facts (like the rising and setting of the Sun) in order to secure power. Of course, forty-six percent of Americans believe that God created humans in their present form within the past 10,000 years. However, a president is required to lead one of the most developed nation on Earth into a future that will be shaped by science and technology. What is striking is that the suggestion that there is still some debate on the age of the Earth is taken that clear proof that he intends to run for President as a touchstone for GOP candidates. That is truly a sad commentary on the state of our political system. I love how people use their own preconceptions to claim another thinks that way, when nothing that other said includes those conceptions. I do realize I used zygote, too, which likely caused your leap. Caps won’t prove or improve your argument as I don’t believe it is a human being at conception though at some stage it does become a life. At some further stage it becomes a human being. Currently, we really use viability as perhaps the point of “humanness” since it can survive outside the womb through technology. I think it’s just as silly to say it isn’t a human being through full-term as it is to say it is at the moment of fertilization or first cell division. That’s a value judgment that goes beyond the words used by the medical profession. To whom did you address your comment? This blog doesn’t allow sub-threads: so, really, to address the issue that so many other idiots raise, the idiots who don’t address a particular person, or quote anyone. to whom are you writing? It’s been a bad month and I’m pissy. “Sorry but we do not make law or science based on colloquial expressions.” Damn you missed the whole point, especially when zygote, embryo, and fetus probably was seldom used before 73 except in science class. It isn’t “abortion is wrong”, it’s when we see changes in terms that dehumanize, it’s a moment for Holmes because something is at foot. As for making law, we’d be doing better if it was colloquial speech. “Child” isn’t colloquial just because it wasn’t used in science class, it’s formal in all other areas. And “collateral damage” doesn’t humanize (but is an example of dehumanizing speech). Once again you miss the point which is that YOUR version is based on religion. Calling something a human being when it is NOT does NOT make it so. THAT is the point. Just because you think it is human at conception does NOT make it so. Calling an acorn an oak tree is absurd. Yet that is in effect what you do if you call an embryo, fetus, etc.. a person. or a baby. In law we do dehumanize people by calling them bodies, as in habeus corpus,. That you don’t use terms like fetus in everyday speech does NOT make a fetus a baby to medical doctors who DO use medical terms as do lawyers and others who MUST use precise speech and terms. In order, at my best guess, you rank 1st in verbosity, I second, and Gene H. pulls at the rear. If you had brought up Eskimo as imprecise, I’d know where to go with your comment. Hell, Gene H. would know where to go. As it is, I’m at a loss. I’ll agree on the zygote and soul, but a zygote is only a few cell divisions leading to embryo/fetus. It’s a religious argument but still raises the arbitrary point of when human. I’m troubled though over another aspect, no one used zygote (why would anyone use zygote when pregnancy, even today is determined well after zygote), embryo, or fetus other than in science class prior to 1973. No one said “how’s the fetus coming along”, it was how “is your baby doing?”. I’m troubled because a change in terms has meaning of view. We dehumanize by changing terms, and in this case it wasn’t to be more scientifically correct. Sorry but we do not make law or science based on colloquial expressions. “The republicans are known these days to be the anti-science party.” Yeah, but anti-vaxers are mostly left, by far, anti-pharma are too (please don’t bring up Christian Scientists). It just depends on what science you want to emphasize. Republicans have a large anti-evolution (may that stupidity go away) and anti-AGW crowd (Climate Change is a political term, it ignores we have fireplaces because of CC), but embrace science when it suits them. Democrats do similar, depending on the science. It is vexing and frustrating I have to admit. But let’ s go back those “few” decades and look at how ideas have evolved. In 1910, no “Special Relativity”, no “Quantum Mechanics”, no “Galaxies”, no “Red-shift”, no “antibiotics”, but as each was uncovered it took decades to understand and reveal what they meant, put them into use, and the revelation continues. You mistake the meaning of dogma. The ultimate sense is pain. It’s PETA’s main argument regarding “humane treatment”. At 37 weeks pain is a likely, human gestation being 38 to 42 weeks roughly. How could anyone believe the ability to experience pain starts with breathe? I don’t see this tied to religion whatsoever. It is a religious matter since the ONLY argument anti-abortionists use is that the zygote has a SOUL at the moment of conception, thus is a full human being. THAT is a religious argument. Law is only concerned with legal concerns which is why the SCOTUS made its ruling that if the fetus is non-viable outside the womb it cannot be considered an independent human being. Simple. When you can produce the soul as evidence in court that we can see and touch or otherwise determine to exist, your concern is moot.